Rotary Clubs in Ireland can nominate candidates to receive a Rotary Foundation grant for post-graduate study in a University abroad. The process requires that the candidates apply for the scholarship and submit themselves to a rigorous schedule of interviews. Last years Drogheda Rotary Club nominee, Emma Lawrence, was successful in the process and is currently studying for a Masters Degree in International Law in Singapore. All memers of Rotary can nominate candidates for this award with the main requirements being that they should not be relatives or family, should not be current members of Rotary and should have completed a degree or expect to complete a degree and wish to undertake further study abroad. Emma is pictured with her dad, Rev. 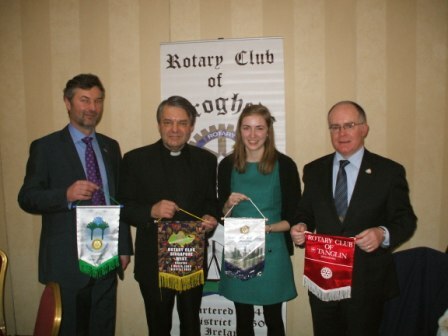 Pat, her Rotary Sponsor, Mark Johnston and the Drogheda Rotary Club President, Donagh O'Brien. They are each holding some of the club insignias that Emma has received when visiting Rotary Clubs in Singapore. Singapore has 23 Rotary Clubs and they have each invited Emma for lunch or dinner during her year in Singapore to speak to them about her experiences in Ireland and in Singapore. It's needless to say that she is having a very busy and very enjoyable time both educationally and socially, and she showed that during her presentation which combined great warmth and entertainment. Congratulations to Mark Johnston who put forward Emma and other candidates on behalf of Drogheda Rotary and who supported them through the process. Congratulations also to Emma on winning the scholarship.